Zygo Head Pointers provide efficient pointing from a psychologically and cosmetically sound perspective - the chin. 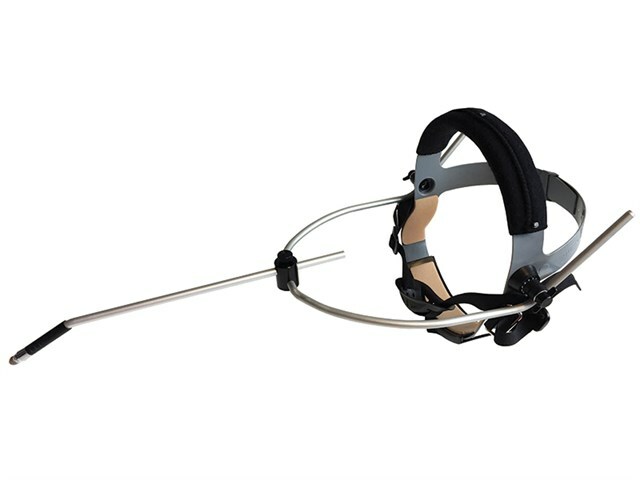 Unlike forehead protrusion pointers, an out from the chin device allows closer proximity to the item being accessed and reduces the head movement needed to activate such a device. Doesn’t interrupt either the wearer’s field of vision or the full view of the wearer’s face. Standard model - fully adjustable, capable of being individually fitted to head sizes from 20-25 inches in circumference. Tiny Tot model - as described above, but it is specially designed for small heads from 17-20 inches in circumference. The headband has a rear strap adjustment and the yoke assembly is sized for these smaller heads. Rear Strap model - this model’s yoke assembly is standard size, but the rear knob adjustment portion of the standard model’s headband has been replaced with a hook and loop strap closure. This is particularly useful when the wearer is seated against any headrest mechanism, where the standard model’s knob would cause discomfort. This model also accommodates adult wearers with slightly smaller than average head sizes, for which the overall yoke size reduction of the Tiny Tot model is inappropriate. NEW! Option to purchase a replacement rod with an iPad accessible tip! For use with iOS, Android and other tablet devices.